TOKYO (Bloomberg) -- Toyota Motor Corp. plans to sell half of its vehicles in emerging markets and roll out 10 more hybrid models as part of efforts to boost its operating profit to at least 1 trillion yen ($12 billion) by 2015. Toyota will also eliminate vice-chairman positions and shrink its board to 11 members from 27 as part of the biggest management shakeup in eight years, the company said today. Among Toyota's management changes, Vice Chairmen Katsuaki Watanabe and Kazuo Okamoto, along with Executive Vice President Yoichi Ichimaru and Director Yoshimi Inaba will step down from the company's board. Ichimaru will become an adviser and Inaba will remain as head of North American operations. 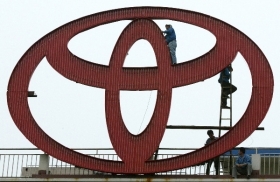 The changes are subject to shareholders' approval in late June, Toyota said. Toyota Motor Manufacturing Canada Inc. Chairman Ray Tanguay will become senior managing officer from April 1 and will be ranked as the highest non-Japanese executive at Toyota. President Akio Toyoda presented Toyota's "Global Vision" plan today, which includes a forecast for 9 million vehicle sales a year by 2015. The carmaker aims to get 15 percent of global unit sales from China, which has surpassed the U.S. as the world's largest auto market for the past two years. "We will focus on emerging markets and environmental vehicles," Toyoda said at a Tokyo press conference. "We will decide when and how much to increase capacity in emerging markets if we need to." The worldwide financial crisis and Toyota's recalls of more than 8 million cars for problems linked to unintended acceleration led Toyota to fall behind rival Honda Motor Co. in terms of profit and operating margin. Toyota's forecasts are based on exchange rates of 85 yen to the U.S. dollar and an annual sales volume of 7.5 million vehicles, Toyoda said. The automaker is planning a separate mid- to long- term management plan "soon," he said. Toyota's 2015 operating profit target compares with a 550 billion yen forecast for the current fiscal year ending March 31. That's still below the record 2.27 trillion yen it earned in fiscal year 2007. The 9 million-vehicle sales estimate compares with a forecast of 7.53 million for the current fiscal year. Fast-growing China, India and Brazil offer the biggest opportunities for Toyota, whose shares underperformed Volkswagen AG and Hyundai Motor Co. in 2010. The automaker relies on North America for about 60 percent of its operating profit, excluding exports, according to the company. As part of its focus on emerging markets, Toyota added the Etios compact in India in December and is readying the small car for sale in China, Thailand and Brazil. "Toyota's plan to develop scenarios for expanding in Japan, U.S., and Europe and separate scenarios for emerging markets shows Toyota is finally shifting their focus to the emerging markets," said Takeshi Miyao, an analyst at consulting company Carnorama in Tokyo. Toyota's slimmer board may help it adapt to challenges and changes in the global industry more quickly, according to analysts. Honda, Japan's third-largest carmaker, also reorganized its management, cutting the number of company directors to 12 from 20, it said Feb. 22.